IEE breaks new ground with a Mobile Processing Unit mounted on a CAT745 for harsh terrain conditions. We design & build high quality and reliable equipment on time, and competitively priced! Part of a shipment for a major upgrade to AN and ANE facilities in the Pilbara Region, Western Australia. Ammonium nitrate is mostly known as a fertiliser used for gardening and agriculture. It’s also the main component in a commonly used explosive, utilised regularly in the mining industry. Manufacturing ammonium nitrate fuel oil (ANFO) explosives is a relatively simple process, which involves combining the correct proportions of explosively reactive substances. The components of ANFO are usually mixed close to the point of operation for safety reasons. The final product, once mixed, is relatively safe and easy to handle. It is used by augering it into drill holes. ANFO is widely used in coal mining, quarrying, metal mining, and civil construction. It’s best used in undemanding applications where its low cost and relative ease of use make it a cost effective solution. It is estimated that ANFO accounts for an estimated 80% of explosives used annually around the world. To keep costs as low as possible, bulk ANFO is used, i.e. 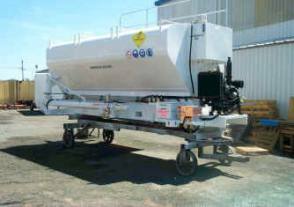 it is mixed on-site, near the borehole by a bulk truck, trailer mounted unit or stationary mixer. Our ANFO mix units represent the simplest method to manufacture ANFO. The units consist of an ammonium nitrate storage tank and a process fuel oil tank. ANFO is discharged using either an auger or a pneumatic hose. Systems are self-contained and manufactured so it can easily be fitted to specialised chassis, standard flatbed trucks or a variety of other equipment. Diesel engines are provided to power the hydraulic system, which operates the augers and pumps on trailer mounted units. The ANFO units can be controlled either electrically or manually via hydraulic levers. Electric controls allow batch and total amounts to be recorded. Specialised controllers can also provide ingredients’ percentages and individual ingredient rates. Using a specialised ammonium truck, the right amount of ammonium can be transported to wherever it is needed, safely and efficiently. Because of ANFO’s stability and relatively low cost, it is still one of the most popular explosive materials in use today. Ammonium nitrate is an oxidizer, and not an explosive material in itself, and is therefore not classified as an explosive for transport purposes. Generally mines prepare ANFO on-site using the same diesel they would use in their vehicles. There are theoretically many fuels that can be used but the low volatility and cost of fuel oil makes it a more popular choice. ANFO is used both in large hole diameter mining through to small hole diameter quarrying. It can be augured or pneumatically loaded explosive. Contact us for all your ANFO requirements. It is a stable and cost effective solution to your explosive needs. © International Explosives Equipment, 2019.